In a concerted effort to upcycle, we’ve drafted up a few ways to transform your empty bottles into elegant wine bottle vases! Take a moment to yourself to relax and recharge by crafting these beautiful vases. Requiring only a few supplies and little effort, express yourself through your own, DIY home décor with these gorgeous decorations. Let’s dig in! While many ask you to soak the labels off of the bottles, AVA Grace wine bottles are designed with labels that are meant to be displayed. 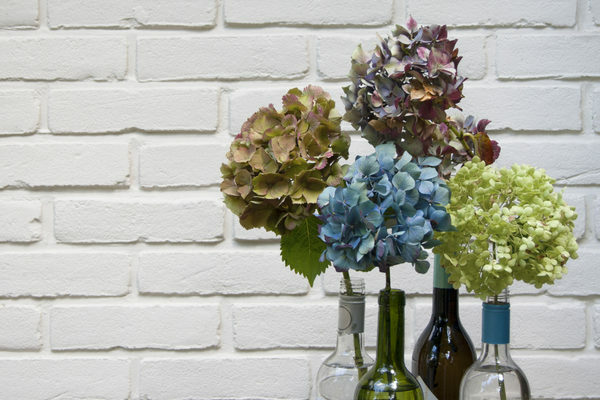 To put together these simple vases, all you have to do is wash out the bottles, add water, and add your bouquets! If you want to completely customize your vase, here is your simple recipe for removing labels from bottles. Add two teaspoons of dish soap to your sink and fill it ¾ of the way full with lukewarm water. Note: hot water can cause the glass to crack if the bottle has not been acclimated to the heat. Once the sink is full enough, add 2/3 cup of baking soda to the water. Place the bottles in the water and let them soak for half an hour. Remove the bottles and wipe off the labels with a towel. For remaining label pieces, rub the bottle with steel wool to remove. Wipe the bottles dry with a towel and decorate! There are a variety of gorgeous ways to decorate wine bottle vases, some only involving glue and a few cloth flowers, while others require spray paint and sparkles. Since everyone’s styles and needs are different, we figured we’d spark your imagination by providing a few starter ideas! Match your vases with your interior design by painting them. To do this, stand the bottle on its mouth (this can be a little wobbly so consider using an old paper towel dispenser to keep it upright) on an old tarp and spray paint it from bottom to top. Wait for it to dry and then decorate! Note: some colors of paint may require a second layer. Following the same design as was seen in our wine bottle candle holders craft, allow your candle(s) to melt around the bottle until the wax has built up. Once the last of the candle has burned, add water, your bouquet, and voila! If you don’t want to remove the label, burlap is a great option as a decorative wine bottle sleeve. A little burlap and glue make a snug sleeve around your bottle in mere minutes. This simple option gives your vase a rustic vibe that can be dressed up or down as you see fit. Staying on that rustic note, twine can be wrapped around all or some of the vase to give it a lovely textured look. Start by using a hot glue gun to glue the start of the twine to the bottom of the bottle. Tightly wrap the twine in circles up the bottle, stopping every few rows to add a little glue to hold it all together. 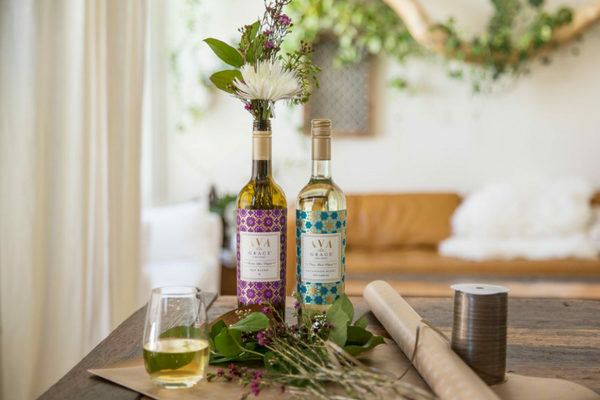 Simple and personalized, make decorated wine bottle vases by gluing pieces of tissue paper, cloth flowers, or other decorations to the bottle. Some crafters even opt to create a photo collage on their bottles, but it’s all up to you! Interested in other ways to reuse your empty wine bottles? Check out our article on DIY wine bottle candle holders!